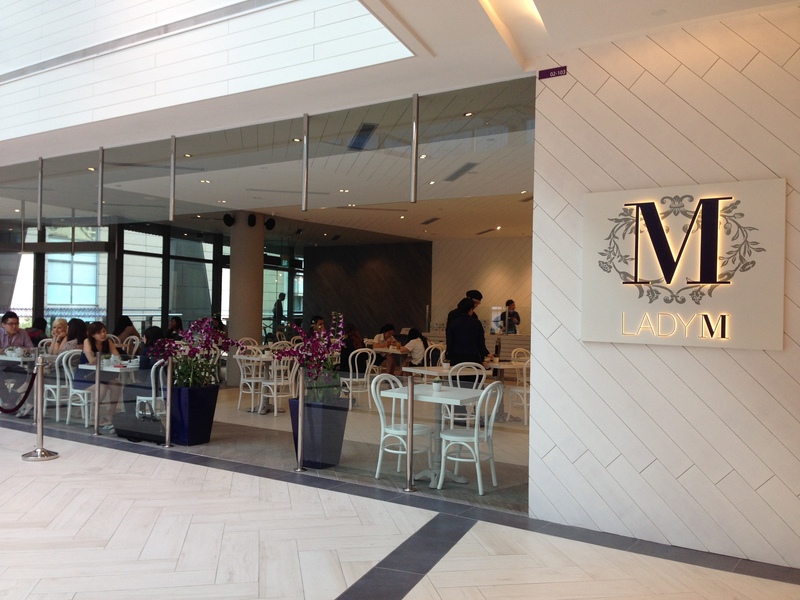 Lady M is situated in Marina Square, just opposite Manhattan Fish Market and Pita Pan (another store we will be reviewing here soon so watch this space!). You cannot miss Lady M because the stark white decorations and the clean feel of the whole place does seem a little out of place in our simple Singaporean shopping centre. It is very chic and very uptown. However, because of the simple and unattention grabbing decoration, all eyes are really on the cakes. The moment you set eyes on this eatery with its very minimalist setting, clean white decorations and concept (where the only pop of colour comes from the orchids that line the entrance of the store), it can be a little intimidating. It reminds me a little of watching movies where people have these quiet, serious, intimate dinners in hushed tones and where the slightest clink of your cup is going to earn you daggered stares. If you like to slouch around in soft sofas, people watch and just enjoy the excitement of coffee orders and servers up and down small cafe spaces, then this isn’t your scene. 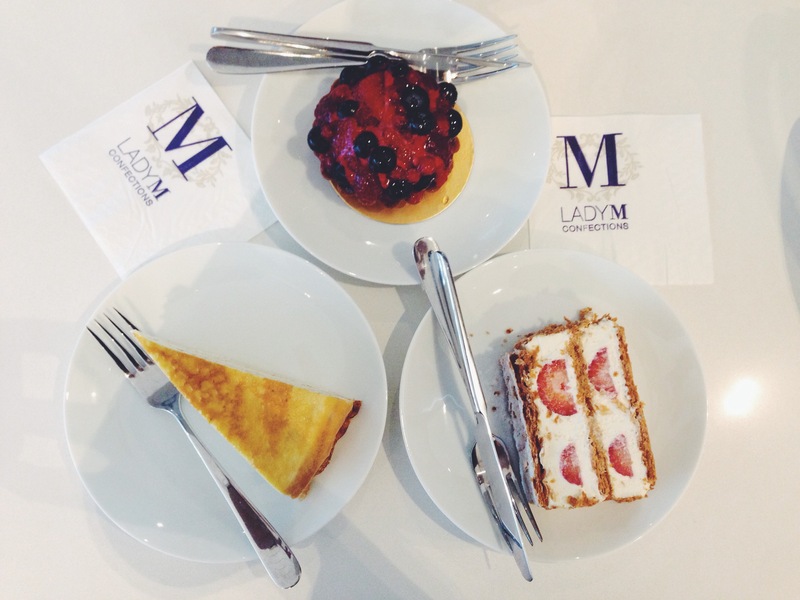 However, if you love the slightly more polished feel of a cafe or cakery, then Lady M might just suit you. Lady M seats about 24 tables worth of people (2-3 seaters) and there were 8 wait staff on duty that day which meant that you didn’t have to wait very long to be served. e) Make payment before you leave. 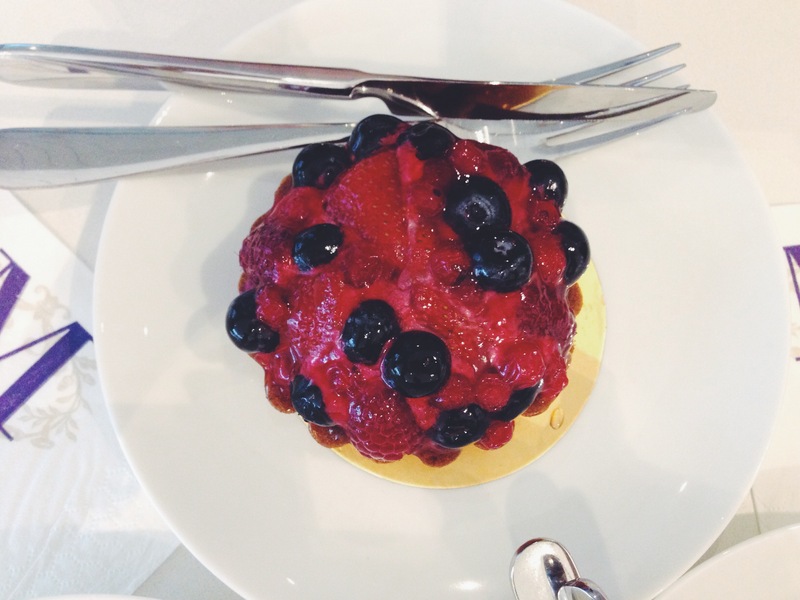 We ordered a Very Berry fruit tart ($9.50), a Strawberry Mille Feuille ($8) and a Mille Crepes ($7.50). This was accompanied by macchiatos and a long black. Please do check before you make your orders for the different cakes and whether they contain alcohol. I had to ask three different servers before getting confirmation from the manager that the Mille Crepes has alcohol in it but that’s the only cake that contains alcohol according to the manager. The amount of cream in there is enough to drive me insane. Call me crazy but as I was eating the cream (and enjoying it might I add), I could just taste the freshness of the cream and how even though it was cream, it was so light! Unlike the cream on birthday cakes, this one was very light and it wasn’t unnaturally sweet. It felt like fresh milk had been creamed and whipped with a small amount of sugar (so tiny that it gave some sweetness to the cream but not too much that it becomes icky). Its consistency was like that of whipped cream only stiffer and creamier. I swear, it felt like the freshest milk in the world had been used to make this cream. Can I just say that I have never tasted cream so fresh, so light and so finger-licking good?? After a while, I abandoned the pastry (which was just as fabulous! not hard, wonderfully crispy but not overly crispy such that there was no flour to bite into) and was happily devouring my cream. The cream complemented the crispy puff pastry beautifully, allowing the pastry to settle down and soften. All the cakes are placed in a cold glass case on display so the cakes that come to you are always nice and chilled. Laced between those layers of milky goodness are fresh strawberries that have been cut to perfection. The tartness of the strawberries is truly a complement for the creamy cream (ha ha) and the crisp layers of puff pastry and adds a different level of texture to the dish. 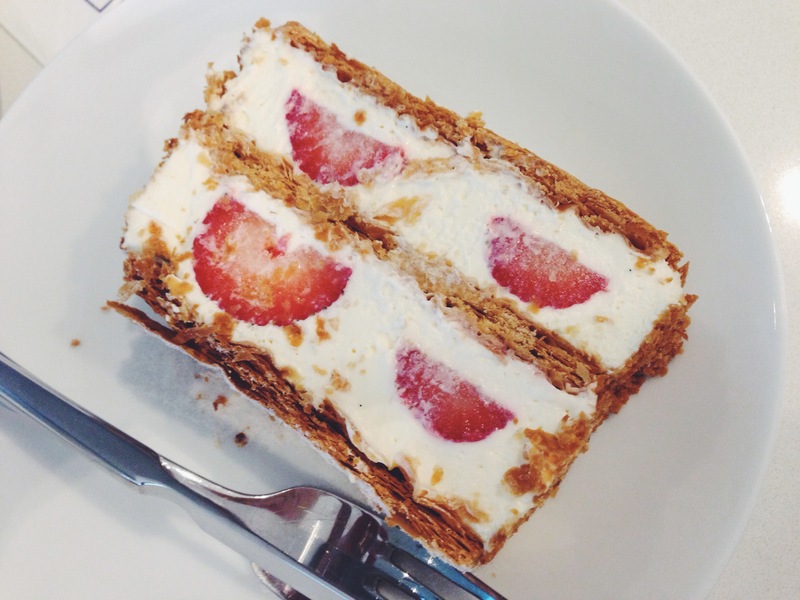 Now, I am slightly biased here because anything strawberry generally wins my heart very quickly but this put the mille feuille I had at Paul to shame. Having had something so creamy and milky, we decided to order the Very Berry tart which is your normal sable crust (sweet pastry) filled with a tart fruit compote and served with a trio of blueberries, raspberries and strawberries. Since I have a sweet tooth, I generally stay away from the tarty dishes because of the sourness that sometimes can overwhelm the entire dish. Looking at the trio of dishes on this tart, I was ready for a sour hit when I took my first bite but the geniuses behind this dish were so smart to use a sable crust! The sable crust is really a sweet crust and it is what you get when you buy fruit tarts (like those from Delifrance). Because the crust is so sweet, it balances our wonderfully the taste of the fruits. I was also lucky enough to get a tart that had relatively sweet fruits.. so it wasn’t as shocking to my system as I thought it would be. Now, with other fruit tarts, the filling of the tart is often a custard or sweet cream to help balance out the sweetness. However, this tart had a little surprise waiting for me inside! When I cut through the tart, I found, nestled under the fruit, what appeared to be a compote of the three fruits. It was pureed to the consistency of a sorbet and because it was chilled before serving, cut quite like a sorbet. However, it didn’t have that icy quality that sorbet’s have so I don’t think it was ice cream on the inside. Rather, it was like a strawberry-raspberry-blueberry paste. I was a little hesitant at first but after the first mouthful, I was back for more. My only gripe with this dish was that even though the base crumbled and was just the right softness, the way a good sable pastry should be, it appeared darker than usual which makes me think that it was perhaps baked at a higher temperature for a shorter amount of time or vice versa. Hmmmm. On its own, there was a little burnt taste to the pastry but it wasn’t too obvious and when combined with everything else, was something even I didn’t realise. The final dish is their signature Mille Crepes. Unfortunately, no one at my table could review this because there was alcohol in the cake and they were kind enough to not charge us for the cake and allow us to ‘return’ the cake to them. 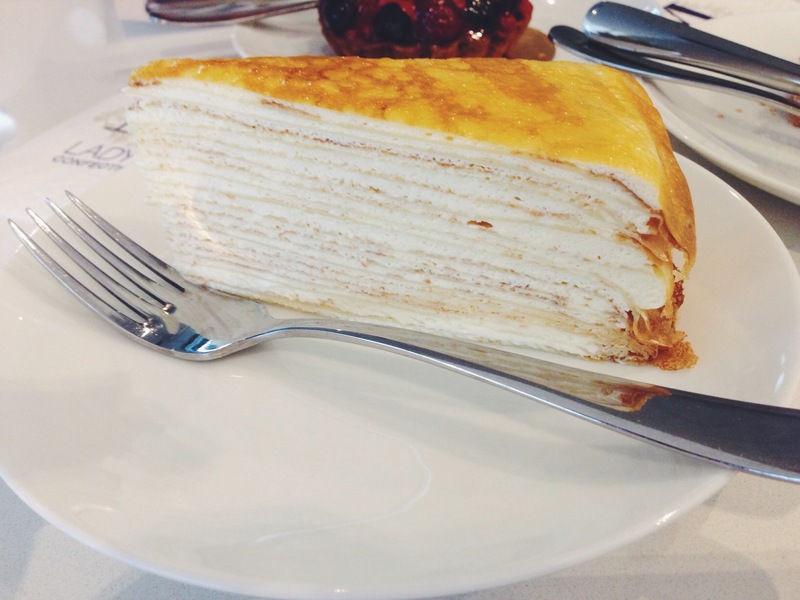 I have however read about their signature dish which is made up of 20 (or more) paper-thin handmade crepes which is layered with cream (if it is anything like the cream from above…. sigh) and it then caramelised ala creme brulee. I can only imagine how this must taste and while I can’t review it … Kit will at some point be dragged down here to review this dish for us. I’d say stop by Lady M for a try, if you enjoy cakes because honestly, these people only sell cakes and have created a name for themselves are being experts in this cake industry. They are so well-known that restaurants buy their cakes to serve as well. If you ask me, this is definitely worth a try. Go ahead, try! Daily: 10am – 10pm daily. Last orders at 9.30pm. Nearest Train Station: City Hall Station. (Marina Square is about 10 mins walk away via CityLink). Vegetarian Options: The cakes contain eggs. But a quick visit to their website will give you a clear indication of which cakes contain eggs and which do not. Our verdict? ♡ ♡ ♡ ♡ / ♡ ♡ ♡ ♡ ♡ (4 out of 5 hearts). We’ll be back for more, definitely. I was there!!! Great review. thanks junie 🙂 another cafe, another day? i stumbled upon your foodblog by accident and it was indeed a fortunate accident! i am somewhat an unorthodox foodie as far as being muslim is concerned. of course pork and lard is out of the question but to find a 100% halal establishment that serves good food (non-halal standards) is like finding a needle in the haystack. unlike our neighbouring country which deemed an eatery halal even if it serves alcohol and as long as pork or lard is not in the menu, the halal criteria in singapore is more prohibitive. thank you for sharing all your info on the halal (or semi-halal) places! i’ve never found a more enlightening resource! keep up the good work! Thank you for your kind words 🙂 The reason why Kit and I (Shereen) began this food blog in the first place is to help people who need alternative food choices. Sometimes, a lot of eating establishments are Muslim-owned (like Penny University and our upcoming review of another cafe) so they do not need to apply for a certificate, OR they have halal meats OR they do have a lot of vegetarian options. Since Kit and I are quite particular in our food choices, we decided we’d put all out information here to share 🙂 Keep coming back and check our updates because we have tons of upcoming reviews that’s waiting in the queue! You can also check out our Instagram: http://instagram.com/thealternativefoodblog or Twitter (https://twitter.com/altfoodblog) to be kept up to date with our latest entries.